Twenty months have passed since President Moon Jae-in took office. For President Moon, already through one-third of his term, what is the most daunting task still on his shoulders? The president picked the most difficult task as the sagging employment index. The government, designating job creation as one of the top national agendas, had poured pots of money into the economy, but the serious unemployment situation couldn’t have been prevented. While delivering a speech prior to a New Year press conference at Cheong Wa Dae on Jan. 10, President Moon said he felt “unhappy” and it was “painful” to have the sagging employment index, falling short of people’s expectations. How to solve that problem is the government’s greatest task in 2019, he said. But President Moon gave no indication of any economic policy changes regarding the poor unemployment stats. Critics said warnings had been there predicting a bumpy road for the national economy, while the presidential office had been stuck to past policy narratives. He added the nation must maintain growth through innovation based on fair competition and income-led growth to make people’s lives well together. Income-led growth and people-oriented initiatives call for boosting the national economy by increasing the average income of households. Under the economic paradigm shift, the minimum wage soared 30 percent to 8,350 won per hour this year. Explaining the rationale of initiatives such as income-led growth, President Moon said benefits of economic growth were concentrated on the upper strata of society and conglomerates. The portion of corporate income versus GDP went up higher than the economic growth rate for a long period of time, but that of household income decreased. Analyzing that the trickle-down effect did not work, President Moon stressed the necessity for a paradigm shift to income-led growth. 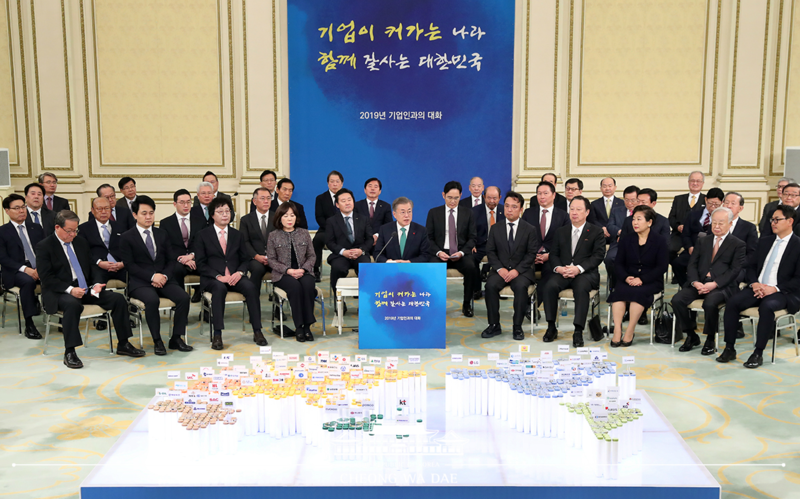 President Moon participated in a New Year greeting hosted by the Korea Federation of Small and Medium Business (KBIZ) in Yeouido, Seoul, on Jan. 2. It was the first time President Moon visited KBIZ since his inauguration, and a New Year event with the President in attendance took place there. His participation at the New Year gathering may be construed as President Moon’s, in his 3rd year in office, focus on taking steps related to SMEs and self-employed businessmen. President Moon has been criticized for not doing enough to help self-employed businesses grapple with serious repercussions caused by minimum wage hikes under the income-led growth strategy. In his New Year message, President Moon said there would be areas in which the government had not expected, failed to care for. His remarks might indicate his determination to choose SMEs as an economic growth axis unlike the past conglomerate-oriented growth paradigm. In this regard, the government’s pursuit of economic structural improvement means innovation of the industry ecosystem, which is closely related to the reinvigorating of SMEs, which play leading roles in job creation and innovation, presidential officials reportedly said. Also sitting at the head table in which President Moon took a seat were National Assembly Speaker Moon Hee-sang, Supreme Court Chief Kim Myung-soo, Prime Minister Lee Nak-yeon, Chairman Park Yong-mann of the Korea Chamber of Commerce and Industry, KBIZ Chairman Park Sung-taek, and Lim Jong-seok, presidential chief of staff. Also present were all four conglomerate heads – Samsung Vice Chairman Lee Jay-yong, Hyundai Motor Group Executive Vice Chairman Chung Ui-sun, SK Group Chairman Chey Tae-won, and LG Group Chairman Koo Kwang-mo , and Lotte Group Chairman Shin Dong-bin.